In all honesty, I do not have a green thumb. When it comes to plant and flowers, as soon as I buy them, they start to die. I know, that is so sad, for me and the plants. It’s not like I haven’t tried to keep them alive, it’s just has to be something I am doing wrong. I needed a fun way to grow plants. Well, I was sitting one day watching TV and what pops on, the commercial for Chia Pets. I have always wanted a chia pet. Thinking this would be the only way I could have a plant survive and bloom to its fullest life. 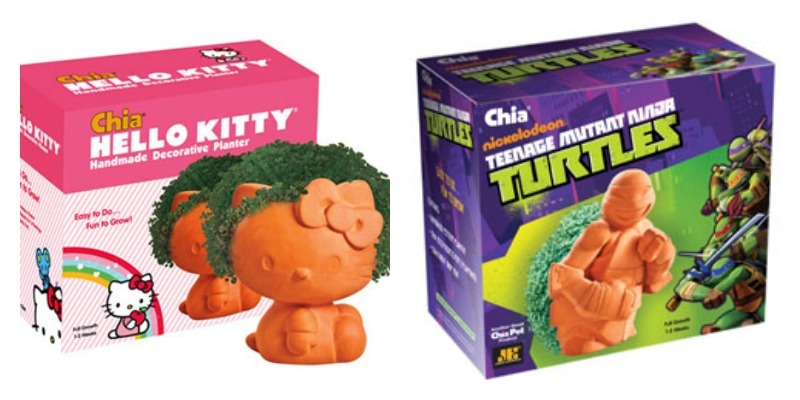 What are chia pets, they are American style terracotta figurines, used to sprout chia. The chia sprouts grow within a couple of weeks, and are made to look like hair growing on your figurine. The moistened seeds are applied to the grooved terracotta figures body and you watch it grow. The instructions are simple to follow and takes no time at all. Kids love to watch their Chia Pet grow and help take care of it. Sprouts begin to appear in 3-5 days. I think Chia Pets are the cutest things! When my Chia started sprouting it’s buds, I was so happy! Finally I was able to bring a plant to life and it was so easy. There is nothing like the anticipation of waiting for the chia seeds to sprout. Once they do, all you want to do is check on the growth every hour, waiting for your Chia Pet to sprout a full head.. For two weeks you have the pleasure of your creation as your chia pet grows in sunlight and with water. A range of generic animals has been produced, including a turtle, pig, puppy, kitten, frog, and hippopotamus. Cartoon characters have also been licensed, including, Disney; Garfield, Scooby-Doo, Looney Tunes, Shrek, The Simpsons, and SpongeBob. These can make the perfect gift for any occasion and can make anyone smile. The anticipation will make anyone feel like a kid again. If you would like to purchase one of your own, head on over to Chia Pet. They even have Chia Zombies! Disclaimer: This product was received from the Company for review purposes only. All thoughts and words in this post are my own and I was not paid to endorse it. I am only voicing my opinion about this product.